Now that Arbor Day has past, people have started thinking more about the importance of planting trees. Trees are wonderful for our planet at large, but they offer many benefits to our own yards and communities that give us additional incentive to keep our yards evolving. If you feel that your yard is lacking something but you’re not sure what, it may be time to plant a few trees. Trees add shade, privacy and character to a space. They can also create division, which is great if you live in a close community but don’t want to invest in a fence. If you want your tree to live a long, healthy life, it’s important that you choose the right tree for the space. Trees can live for generations, so what you plant today may very well be there for your great-grandchildren. Native tree species are generally best since they’ve had centuries to adapt to the area. Consult with an arborist to get suggestions for your particular situation.Usually, most people start with the most basic element: evergreen or deciduous. Evergreen trees keep their leaves year-round and are ideal for areas that require wind blockage and privacy. They are best planted on the north side of the home. Deciduous trees lose their leaves in the fall and winter and grow them back during the spring. They provide shade in the summer and warmth in the winter since the sun can shine through. 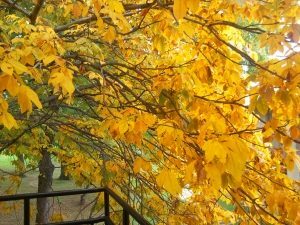 Deciduous trees are best planted on the south, east and west sides of the home. Another important factor is the size of the tree. There are a variety of shapes and sizes, including tall and skinny trees and short and wide trees. Obviously, the tall, larger trees will be ideal for shading the home and offering privacy. Just remember that these trees may one day tower over the home depending on where they are planted. Short, wide trees are ideal when defining a space. The location is also something to pay attention to, as you want to select a spot in the yard that receives plenty of sunlight and has adequate pH and moisture conditions. While trees are often flexible, it’s darker, more moisture-prone areas to watch for, as these conditions can create fungus and mold growth in trees. If you’re limited on where you can plant trees, stick to a species that will do better in shady conditions – American holly, dogwood or hemlocks –or wet conditions – red maple, river birch or sycamores. Other factors to keep in consideration are that trees should be planted 10 to 15 feet away from the foundation of a home and 5 feet away from fences, patios and other structures. Also pay attention to where the utility lines are, as you don’t want a mature tree to interfere with them. Chances are, you’re planting trees for more than just obligation. You want to achieve a certain look or purpose. In this case, knowing exactly what you want the tree to do will help you in choosing the best species. For instance, if you want to create a natural fence, American holly or Southern magnolia are great options. If it’s shade that you’re after, consider oaks, maple and American beech trees. Finally, think about some of the other factors that will put your yard together. It’s a good idea to vary your landscape, so there’s no reason why you need to spring for several of the same trees. Think about the fall colors of the leaves, flowers that will bud in the spring and fruit that will grow in the summer. This color and natural beauty can really set the stage for a magnificent backyard. Trees that flower include Japanese maples, crabapples and flowering cherry trees. Happy Spring! It’s time to get planting!